Mario grew up in Seattle, Washington, one of three children born to Marilyn and Armandino Batali. He spent his childhood watching his grandmother make oxtail ravioli and other Italian specialties passed down in the family. Mario’s father, an engineer for Boeing for 30 years, opened a meat-curing shop in Seattle as a retirement project, attempting to recreate the Italian foods store Mario’s maternal great-great grandparents opened in 1903. 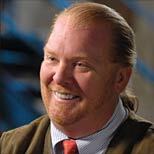 The Batali family’s roots are almost entirely in the West. Mario’s great-great-grandfather left Italy for Butte, Montana in 1899 to work in the coal mines and eventually moved further west to settle in Seattle.